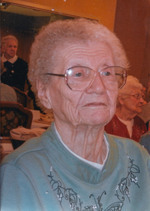 Ruby Seebach, age 94 of Woodsfield, Ohio passed away Monday April 15, 2013 at the Woodsfield Nursing & Rehabilitation Center. She was born April 12, 1919 in Bridgeport, Illinois a daughter of the late John & Carol Briggs Miller. In addition to her parents she was preceded in death by her husband Elmer “Shorty” Seebach. Ruby is survived by her niece Marlene (Paul) Reischman, one great niece and four great nephews. Friends will be received from 1 p.m. until time of Funeral Service at 2 p.m. Friday April 19, 2013 at the Bauer-Turner Funeral Home 100 S. Paul St., Woodsfield, Ohio with Rev Susan Lehosky officiating. Burial will follow at the Oaklawn Cemetery Woodsfield.